Lee & Low Books, 9781620142851, 32pp. Casey loves to play with his blocks, puzzles, and dump truck, but he also loves things that sparkle, shimmer, and glitter. When his older sister, Jessie, shows off her new shimmery skirt, Casey wants to wear a shimmery skirt too. When Jessie comes home from a party with glittery nails, Casey wants glittery nails too. And when Abuelita visits wearing an armful of sparkly bracelets, Casey gets one to wear, just like Jessie. The adults in Casey's life embrace his interests, but Jessie isn't so sure. Boys aren't supposed to wear sparkly, shimmery, glittery things. Then, when older boys at the library tease Casey for wearing "girl" things, Jessie realizes that Casey has the right to be himself and wear whatever he wants. Why can't both she and Casey love all things shimmery, glittery, and sparkly? 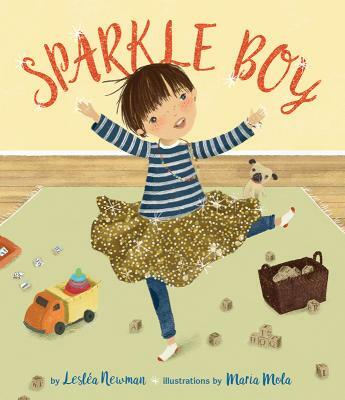 Here is a sweet, heartwarming story about acceptance, respect, and the freedom to be yourself in a world where any gender expression should be celebrated. Sparkly things are for everyone to enjoy.